The versatile S model steel arch building kit is our most popular arch building design with a variety of uses. The S Model steel arch building has a rounded roof with vertical sidewalls and is available in 10 to 50 feet wide and 11 to 20 feet tall roofs with unlimited length. 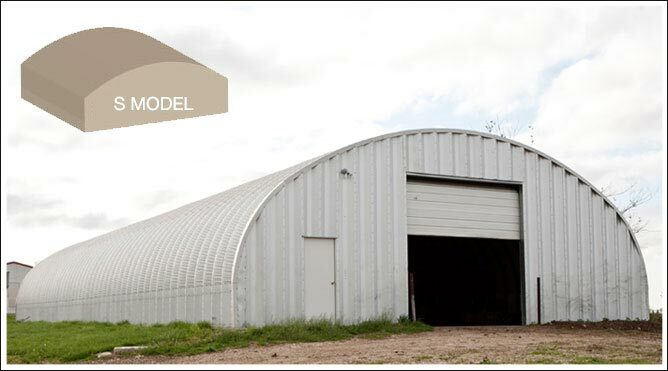 Because of its unique arched design this metal building kit is used by our customers for horse barn metal buildings, warehouse steel buildings, truck storage garages, fire departments, construction equipment storage, metal airplane hangers, businesses and workshops. This building is ideal for industrial, military steel quonset huts and agriculture applications. The side walls, like the P model arch building allow for shelving and work benches along the sides. With the clear span design there are no beams or posts giving you 100% interior usability. You can design your building with custom door openings depending on the use. Store 18 wheel tractor trailers, farm equipment or recreational vehicles. The arched rounded roof makes for the perfect building for wind resistance like hurricanes and especially designed to channel away heavy snow loads. You can always expand the building as your needs may increase by just unbolting the end walls and adding more arch spans. Choose from several accessories such as three types of metal building insulation, ventilation, or overhead doors of walk through doors and garage kit skylights. Coated with AZ55 Galvalume® Metal Building Kings S model arch buildings are resistant to rust and provide maximum durability. There are no beams or poles which give you 100% interior usability. Our metal buildings are made in our manufacturing facility right here in the USA... 100% American Made. In addition to Made in The USA, you get the best metal garage kit price of any seller in the country for the highest quality materials you will find anywhere. We never sacrifice quality. Our materials and components are the best made and exceed industry standard specifications and certifications. Durable to sustain major weather events such as torrential rains, heavy snow storms, hurricanes and earthquakes. AZ Galvalume® Steel - a superior steel alloy containing aluminum and zinc which was developed by the steel industry to provide extensive durability that is 700% more rust resistant than galvanized steel.